School summer break is almost here. My daughter finishes school in a week or so, and with it comes the good and the bad of having a 6-year-old who requires supervision and entertaining. For the time being, I am concentrating on the fact that I will no longer have to get up very early every day. For a night owl like me, that is music to my ears. Yay sleeping! I remember that before I had children every mom I knew would describe the job as “Incredibly hard, and incredibly rewarding. And you will not know until you are a mother yourself”. I found the explanation trite, cliched, and frankly, unsatisfactory. Boy what a surprise, when I had my own child I understood exactly what they meant. And they were right. Now, I am the first to admit that when it comes to children I struck it lucky and picked an easy one. My daughter is very healthy, a sweet, quiet, smart kid. She started sleeping long hours at night long before her pediatrician thought it was a good idea (my answer? Hunger is stronger than sleep, if she’s hungry she’ll wake up). As time passes it has gotten better, now it is just a matter of waiting for the dreaded adolescence to arrive. I am afraid she will make me pay for the years of easy parenting. My dear mother, on the other hand, did not have it nearly as easy. I was a very sickly child, and poor mom endured the pregnancy with my brother while I spent long months in the hospital. I have to say that I cannot imagine what she went through. And while I am appreciative of the fact that my adventures in motherhood are far, far easier than my mom’s, that doesn’t mean that some days I am not tired, or scared, or doubtful. Some days I wish I could hold my child really tight and not let her go. One day she’ll leave the nest, and perhaps the worst part of this journey will start, knowing that I cannot longer protect and look over her. These thoughts have led me to appreciate my mother’s job even more. Sunday it’s Mothers’ Day here in the DR. This is a serious celebration, with people making pilgrimages back to their hometown to spend time with “mami”. So for all Dominican mamis, have a fantastic day, I hope you have the chance of hugging your children that day or at least get a call. Put away the pots and pans and rest. Let others pamper you, you more than deserve it. For this recipe, I used World Harbors Lemon Pepper and Garlic Marinade. A surprising combination of sweet, sour and tangy. If you want to please mom this weekend (whether or not is Mothers’ Day where you live) you definitely have to try it. To make it more interesting I paired it with sweet potatoes, carrots, and pineapple for a one step meal. Easy and absolutely scrumptious. And by the way, I invite you to go to World Harbors Facebook page to learn more about their Golden Label in-stores promotion, launched this past Monday, 5/21 and the Adventure Sweepstakes, an online sweepstakes hosted on the World Harbors Facebook page live since Friday, 5/25. Six winners could win instant exotic adventure trips. Don’t miss it! Chicken with Lemon and Garlic Sauce Recipe: A combination of sweet, sour and the kick of freshly ground pepper in a tender, fall off the bone-chicken. Mix all the sauce ingredients (use either prepared sauce, or homemade, NOT both). Heat over low heat until it breaks a boil. Remove from the heat and cool to room temperature. Place the chicken legs in a zippy back and add the sauce mix, moving around until the meat is coated with the sauce. Marinate for at least two hours in the fridge. Heat the oven to 350 ºC [180 ºC]. 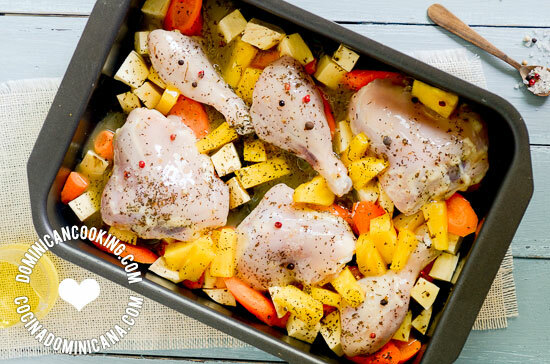 Place the sweet potatoes, carrots and pineapple in a baking pan. Put the chicken legs on top of it and drizzle everything with the sauce in which the chicken marinated. Roast for 30 minutes or until the chicken is golden brown. This post was sponsored by World Harbors Sauces and Marinades, I received compensation and products in exchange for this post but these opinions are 100% mine and have not been vetted or altered by the sponsor. You can try it, it will probably work.